These stylish nesting bowls do it all: storage, prep, serving, and decor. Get ready for storage, prep, serving, and decor—times four. 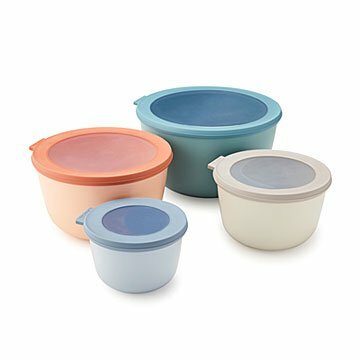 This set of stylish nesting bowls is pretty enough to keep on display, yet durable enough to get the job done (read: leak-proof, air-tight, and safe to use in the microwave, freezer, and dishwasher). Designed to satisfy every food stage—from stacking in the fridge/freezer to eating at your desk/dinner table—your other dishes just might wonder where you've gone. Made in the Netherlands. Dishwasher and freezer safe. Must remove lids before placing in microwave.